The City of St. John’s invites residents and visitors to celebrate St. John’s Days from June 22-24. Free events to appeal to all ages and interests are scheduled to take place at several locations throughout the weekend. 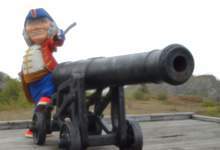 The St. John’s Days festivities begin with a bang when Mayor Danny Breen is joined by members of the Association for New Canadians at Signal Hill National Historic Site to fire the Noon Day Gun on Friday, June 22. For more details and the complete listing of St. John’s Days events check the Events and Festivals page on the City website.